When you're in college, it's hard to leave the bubble of campus. Your classes, professors, friends, books, and bed are within 10 blocks of campus. There's no real reason to leave if everything is so conveniently close. But, on breaks like Fall Break, I leave the bubble to go home for a long weekend. And whenever I'm home, I'm welcomed back into Manhattan with a tasty, cheese-filled dinner at either a new trendy restaurant or at one of my family's old loves. I've heard only good things about The Dutch (www.thedutchnyc.com/) which is located in lower Manhattan at 131 Sullivan Street. The Dutch is an American Restaurant and their dinner menu is interesting. I use "interesting" for the menu's rare finds and unique ingredient combinations. As per usual, I asked for a cheese plate for my entree. 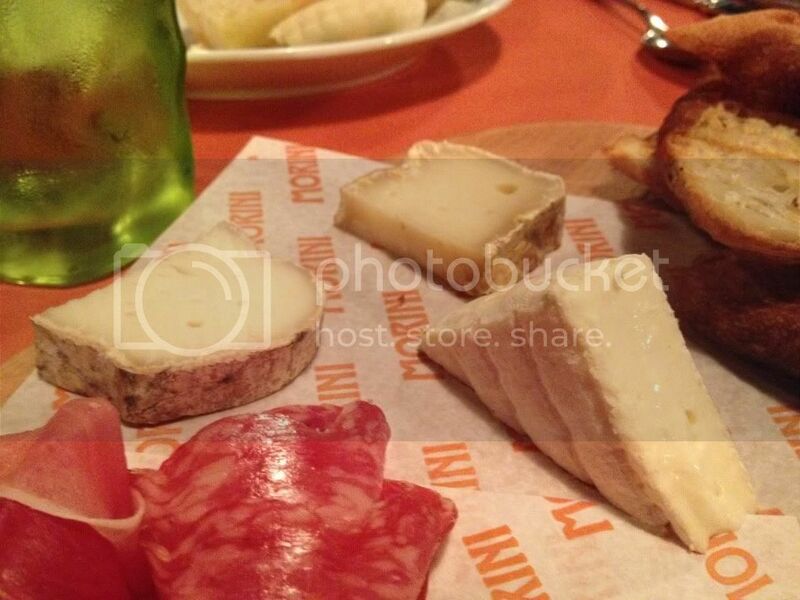 Below is a picture of my cheese plate and a list of the cheeses ordered! 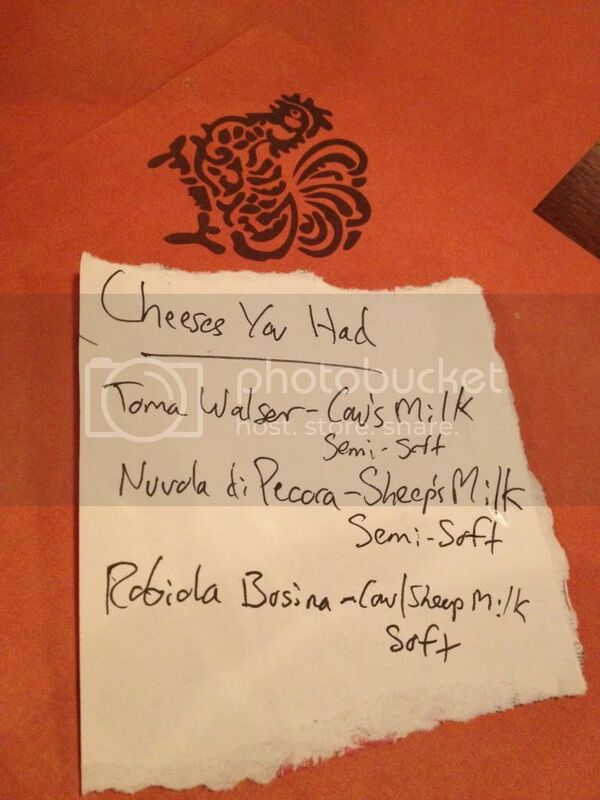 While the food was only ok, the cheese list was refreshing. It's too often that I go to a restaurant and order a cheese plate where some generic form of cheddar or brie is on the menu. As someone who has sampled 100 cheeses in one day (more like one afternoon), it's hard to find a cheese I have yet to come across. At The Dutch, I had never tried Esmontonian or Mt. Alice. I even felt a little embarassed writing this and confessing that I haven't tried the majority of the cheeses listed on the menu. Thus, I applaud The Dutch for being adventurous with their cheese offerings and would highly suggest you try Esmontonian of Caramont Farms, VA if you're into goat's milk. Otherwise, you can never go wrong with Ewe's Blue or Alpha Tolman. Thanks to The Dutch I had an enjoyable fall break in the city. It was a great start to a weekend full of catching up with family and friends over good food. I was ecstatic when I found out that Citarella was selling Rogue Creamery's Smokey Blue. I normally only indulge in blue cheese at restaurants in small quantities, but this is one of the special few times when I actively ask the cheese guy at Citerella for a half a pound of blue to bring home and (almost) finish before dinner. A crumbly blue, Rogue Creamery's Smokey Blue has a distinct smoked flavor that offsets the usual sharp flavor and is a favorite to those who rarely enjoy blues. The cheese-obsessed person i am, this has been my replacement for popcorn during a movie and I've exchanged my midnight ice cream scoop for a sliver of this. It's just that great! Crumbly, smokey, sweet, tangy, I love you Smokey Blue. On the CSI:NY episode that aired on 02/03/13, "White Gold," there were deaths due to cheese because the ground mozzarella looked like cocaine. The episode's title, "White Gold" refers to cheese smuggled from the U.S. to Canada because of cheaper prices in the U.S.. Apparently, according to the show's plot, the pizzeria owner (whose nephew was killed) said that "greaseballs" came in here and spoke about how cheese was cheaper here in the U.S.. The "greaseball" Canadians said if the pizzeria owner "found a way to get the cheese over the border, [the pizza shop owner] could make 4 bucks a pound. Smuggling cheese-- no risk high reward." The murderer had mistaken cheese for cocaine, which is why when he saw the pizza shop owner's nephew loading blocks of cheese into a secret compartment of a van, the murderer thought by obtaining the cheese/cocaine, he could make millions. "Cheese. You murdered two guys over some cheese?" Just thought I would inform you all that cheese is now the center of crime show drama. I love cheese but rest assured, not enough to kill for it. But, I do in fact think the nickname "white gold" suits how much I value fancy cheese. Did you watch the episode?